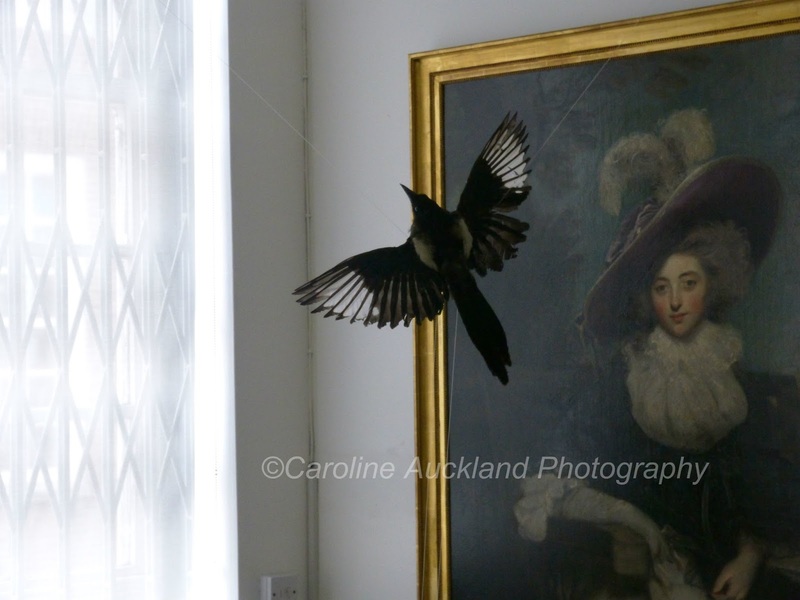 Fabulous afternoon with photographer Andrew Bruce at Tunbridge Wells Museum. After considering photography in its historical context with a whiz through Fox Talbot, Galton and Potter's taxidermy cats through to modern day wildlife photographic images we then had our chance to have our hands on experience with taxidermy animals. No-matter what one thinks about stuffed animals the fact is the Victorians travelled the world, killed and then catalogued it and our museums are stuffed full, literally, with examples of their work. For many of us, visits to museums as children is how we have informed our early knowledge of strange and peculiar animals. 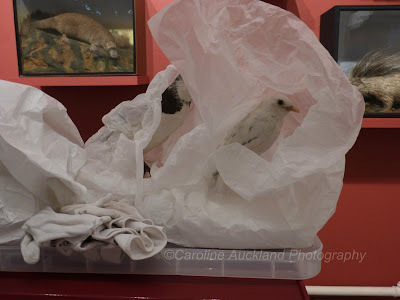 Nocturnal specimens alongside exotic creatures and the more familiar birds and family pets, placed behind glass gazing out of their cases forever frozen in time. I was attracted to a singular magpie and with the words one for sorrow in my head I explored the museum for a place to exhibit her alongside another artefact. 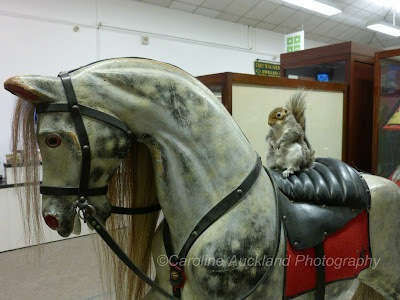 I did have a play with a squirrel called Colin as well. Attracted to a portrait because of the feathers in the hat, I placed her with the aid of tripods, string and Andrew's help. Sometimes you do not need to know any more. For me the result is about possession and freedom. This bird does not want to become just feathers in a hat in much the same way as the female image is a portrait, she is also an object, a possession. I wanted to show an attempt at escape towards the light, but of course the bird is caged within the museum the exit barred by grills and all is an illusion. I later find that this is a marital portrait and that the sitter has already rejected two suitors. A feisty lady, with individual wealth, she knows that all she possesses will become her husband's on marriage. She will be his possession, her property his. My bird has flow out of the portrait but in reality both are objects, both no longer alive, and both frozen in time. Then it was time to wrap the exhibits up to go back into the storeroom. Oil on Canvas, Frances Molesworth, Marchioness Camden, late 1780's by Sir Joshua Reynolds on loan to Tunbridge Wells Museum courtesy of the Trustees of the 5th Marquess Camden Will Trust.